The compact LTG Brake Cooling System was especially developed to cool the brakes at the undercarriage of aeroplanes, specifically the types Airbus A380 and Boeing B777. For efficient cooling, the BCS is placed right at the braked wheel. 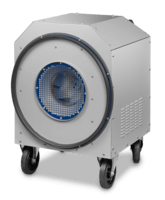 The BCS cools the brake components with the integrated LTG high-performance fan through the rim openings. The air outlet at the BCS is beneficially pointing down so that unimpaired and low-noise work below the airplane is ensured. The cooling process of the brake discs is considerably accelerated with the BCS. Within a very short time, the aeroplane is ready to take off again. Quick cooling within a few minutes. Can be used for aeroplanes of type A380 and B777. Can be used flexibly mobile and without any wires. Energy supply via rechargeable batteries.